One of the most well-known lines in film history. Having achieved high honours from film critics and an ever increasingly number of Blade Runner lovers, this film has conquered a top position in the list of unforgettable sci-fi movies, but it has also become a landmark in the world of filmmakers. One reason of its success has been the author of these lines, Rutger Hauer. He felt uncomfortable with the long text in the original script of Batty's final monologue, so he asked the director, Ridley Scott, if he could try a more condensed version. More heartfelt, less time-consuming, less opera. Since then, those words have become the symbol of the ever-lasting fight between Good and Evil, man and machine, between abuse of power and the right to freedom. And lastly the longing to live longer which all people share. These lines inspired Rutger Hauer in a fruitful meeting with his Milanese staff, PierPaolo and Grazia De Fina, to set up an International Film Festival, naming it ‘I’ve Seen Films’. Challenging all film authors, inviting them to show him films that can be inspired, hard-fought, spirited, powerful, light, innovative. Opening doors (the famous ‘Tannhäuser gates’ ?...) to creativity, and to the artistical and technological imagination. I’ve Seen Films is a unique asset for filmmakers all over the world. 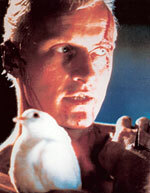 Like Rutger is fond of saying ‘Each film is like a bird, all we need to do is make it fly’.